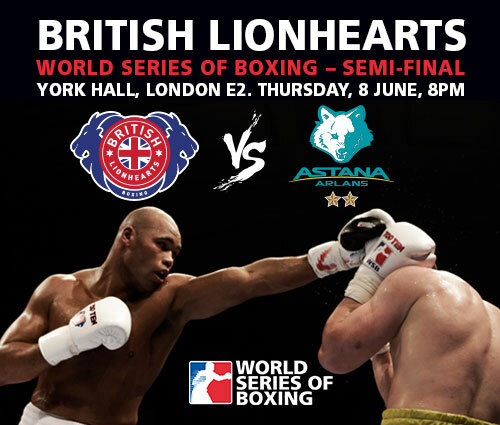 Tickets are now on sale for the British Lionhearts’ World Series of Boxing Semi-Final, second leg vs Astana Arlans Kazakhstan. The match will take place at 8pm on Thursday, 8 June at London’s York Hall. Following a thrilling tie-break victory against France Fighting Roosters in the Quarter-Final, the British Lionhearts have been drawn against familiar foes. At the same Semi-Final stage last season, the Lionhearts defeated the Arlans 7-3 and will be looking to repeat this performance for a place in the Final where they could face either Cuba Domadores or Colombia Heroicos. The contest will feature five bouts of five rounds at Flyweight, Lightweight, Welterweight, Light Heavyweight and Heavyweight. Tickets cost £20 and can be purchased at www.theticketfactory.com or by clicking here.